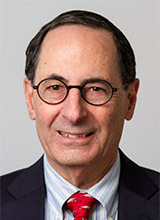 » Q&A: What is Cancer Overdiagnosis? Division of Cancer Prevention Director Barry Kramer, MD, MPH, answers questions about cancer overdiagnosis. Q: What is cancer overdiagnosis? A: Cancer overdiagnosis is the detection of asymptomatic cancers, often through screening efforts, which are either non-growing, or so slow-growing that they never would have caused medical problems for the patient in the patient’s lifespan. Some of the detected tumors may even resolve spontaneously without treatment. They therefore represent an important cause of overtreatment, which can involve serious harms and toxicities such as deaths from surgery, major organ deformation or loss, and second cancers from radiation or chemotherapy. Q: What should people know about it? A: It is important because of the health consequences to the patient. Treatment of overdiagnosed tumors cannot benefit the patient, and yet can incur important harms. People should know that many screening tests can generate overdiagnosis, and that the harms resulting from overdiagnosis should be weighed against the potential benefits of the particular screening test under consideration. People should know that not all cancers detected by some screening test need to be treated. Q: How do different types of cancer screening methods influence overdiagnosis? A: Ideally, screening tests would only pick up cancers that would grow if left alone and for which we have effective therapies to change the outcome. However, many available screening tests will lead to overdiagnosis, and screening is the major driver of overdiagnosis. This can happen in different ways: The test itself detects slow-growing or non-growing cancers, or the test is nonspecific but it leads to the incidental finding of the non-growing cancer. 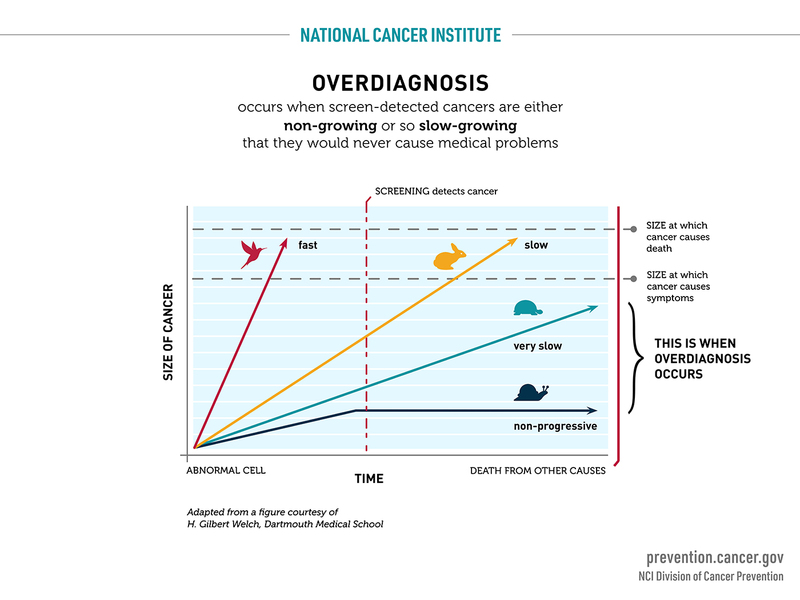 Overdiagnosis can also occur if a screening tests picks up a cancer with potential to grow, but the patient has a short life expectancy due to advanced age or other intervening illnesses. Examples would be the PSA test, which is prostate specific—not prostate cancer specific—but since many men harbor non-life threatening prostate cancers, the PSA test can non-specifically just indicate an enlarged prostate, and the follow-up needle biopsy may uncover an incidental cancer. Another example is CT scans of the abdomen, which have come into wide clinical use, can pick up tumors that had nothing to do with the original reason for the CT scan. So that if somebody comes in with nonspecific abdominal pain, a CT scan may show a small indolent tumor in the kidney; or if they get a CT scan in the lung for lung cancer screening it can lead to the diagnosis of an indolent non-lung cancer in the kidney. Q: How much overdiagnosis exists? A: We are learning that it is more common than we assumed for a long time. The amount of overdiagnosis differs according to the tumor type, its biology and the screening test, so that as the screening test gets more sensitive it will pick up more indolent cancers. And if the underlying biology is on average slower in growth, like prostate cancer compared to pancreatic cancer, it's more prone to overdiagnosis. Some have used the analogy of birds, rabbits, and turtles or snails. The birds, which can fly before the test can ever be done, represent the fastest growing cancers, which are not likely to be picked up by screening. They spread so quickly that the screening test is of little value. The turtles or snails move so slowly that the screening tests are not even needed because the same good outcome occurs irrespective of the screening test. But screening tests are particularly good at picking up the slowest growing tumors. And then the intermediate ones (the rabbits) we may be able to detect in time and intervene to change the outcome. Q: How does overdiagnosis differ from misdiagnosis and false positives? A: Overdiagnosis can occur when a positive screening test with a resulting medical work-up leading to a biopsy with agreement amongst pathologists that the biopsied tissue represents a “cancer,” but a cancer that would never harm the patient. Misdiagnosis happens when a pathologist makes an incorrect diagnosis and therefore, other pathologists would disagree that it's cancer at all. On the other hand, false positives occur when there is a positive test, but after a workup the patient is found not to have cancer. Q: Is cancer the only disease in which overdiagnosis occurs? So, it's important to get investigators from all of these fields and disciplines together to talk about what is known about the natural history of the diagnosed conditions; what the driving factors are; what the consequences are; and to the extent known, how to mitigate overdiagnosis; and how to counsel patients about screening tests for a variety of diseases. International and national scientific conferences have convened health professionals and scientists over the last several years to support these kinds of efforts. Q: What is the Division of Cancer Prevention doing to address this problem? A: One of the ways to mitigate the harms of overdiagnosis is to develop more accurate methods of predicting the behavior of screen-detected cancers at the molecular level. That would help us distinguish the screen-detected cancers that are important to treat from those that should at least undergo observation before we consider treating them with often toxic therapies. This is an attempt to get us beyond the 100-year-old methodology of simply biopsying tissue, staining it and looking at it under a microscope. It's an attempt to see which tumors, many of which look the same under the microscope, will have different behaviors. This requires a broad spectrum of scientific disciplines that include physicians and other health professionals, epidemiologists and population scientists, statisticians, as well as molecular biologists and molecular geneticists. And that is the very mix of people that are brought together in our Early Detection Research Network and the Consortium for Molecular Characterization of Screen-Detected Lesions, which is specifically devoted to characterization of overdiagnosis at the molecular level and mechanistic studies of the molecular pathways that drive tumor progression. This is an issue that sits at the interface of better biological understanding and clinical decision-making and screening, and therefore two NCI divisions that each bring those perspectives and strengths are collaborating on that project—the Division of Cancer Biology and DCP. Another program we support is the Consortium for Imaging and Biomarkers, which addresses overdiagnosis by seeking to improve cancer screening, early detection of aggressive cancer, assessment of cancer risk, and cancer diagnosis by integrating imaging strategies with biomarkers into complementary approaches. The Pancreatic Cancer Detection Consortium, which was established in accordance with the Recalcitrant Cancer Research Act of 2012, also develops and tests new molecular and imaging biomarkers, but they are aimed at detecting early stage pancreatic ductal adenocarcinoma and its precursor lesions.